I want to start today’s post here – it sums it up beautifully. …and now how we got here…..
Today I discovered “Storify” – a fantastic web-based application for collecting conversations from a variety of places on the web, i.e. Twitter, Facebook, Flickr, Instagram, any website (article, etc.) via URL, and YouTube. As the name insinuates, the site allows you to create a story – a conversation piece from multiple sources – thus pulling multiple tools into one. It got me thinking of the following strategy for parent engagement using these two tools (Twitter and Storify)…. With this strategy, these posts would offer timely, ongoing, and dynamic info-snacks that could include activities happening at a school as they happen (with photos), links to student work or school improvement ideas, or general school information. Questions could also be posed that request suggestions and/or feedback. 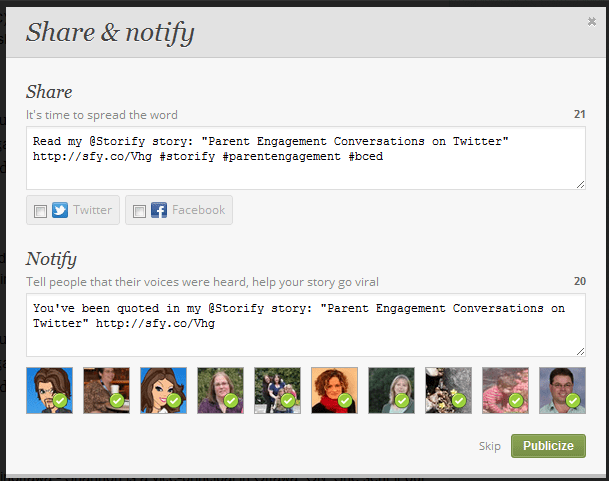 Use “Storify” to collect the topic of conversation, in this instance #parentengagement and add each piece. Then, add anecdotal commentary below the tweets, so that each person’s comments are addressed, added to, and valued. Links, videos, and other media can be embedded so that readers can easily find, consume, and then contribute to the information provided. In this way, the conversation started on Twitter is collected and commentary is added as to how each component adds to the conversation / topic or how concerns could be addressed. Share the story via Twitter and notify each person referenced that they have been mentioned in the story. This shows each person that their voice is valued as a contributing memeber of the conversation and will provide a place for it to continue moving forward. As @MommaYomma mentioned during the conversation at #parentengagement, people can’t buy in or participate if they don’t know the conversation is happening or are unaware (see below). She also mentions that this topic could be “a fad” and I can adamantly add that I hope not. We will keep the topic alive. This way, people are informed that they have been referenced, thus informing them of your addition to their digital footprint, and showing them that the conversation was not empty or void of intent to follow through. As can be seen here, the story can also be embedded in a blog or school website for further elaboration or sharing in an open and transparent way. The story of #parentengagement has been extremly inspiring for me this weekend. Please see below…..